I was happy to have Indigenous People Day to get out for a short hike. I asked my daughter to go with me and she actually agreed to wake up early and go. This was exciting because it has been over a year since she’s gone hiking with me. I told her we wouldn’t go too far and it would be pretty. Check and check. We woke up at 5:00 am to get to an overlook by sunrise. Fortunately (or unfortunately) there was a lot of fog. 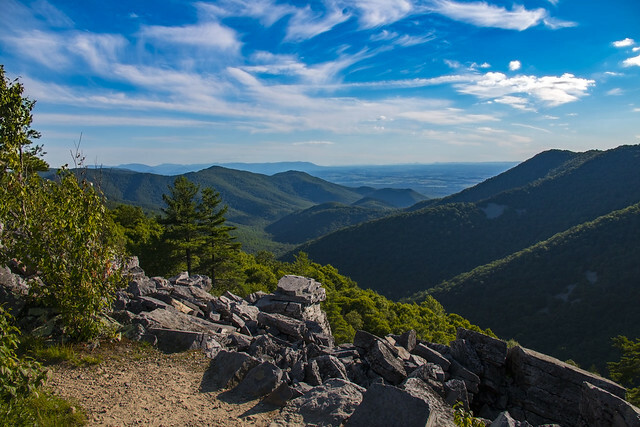 Since we would be in the North District for Shenandoah National Park for our hike, the overlooks were few and far between on the east side. They get better as you head south in the park. I found one and we waited. Finally, the sun came up and illuminated the fog. I had not brought my 18-200 mm lens and wish I would have for this morning. I could have gotten a better shot of the fog against the mountains. My wide shot was okay but sometimes zooming in is also good in landscapes. We drove back towards our hiking location as I worried about the sun being too bright for a waterfall. As we started down our path, I was happy with the cover and the fact that the waterfall was located on the west side of the trail. This means the light wouldn’t reach it for a couple of hours. The hike to Lands Run Falls is very short. It took us no more than 10 mins or so to reach the falls (or the first part of the falls). Some fall colors were showing and leaves were scattered around the rocks. This made for great photos. I am normally alone when I hike but having my daughter with me allowed me to crawl down the rocks. She handed my tripod to me and I took photos from further down. I debated going farther down the rocks but they were slippery and there was no way my daughter would know if I fell (the falls were that loud). I took some shots and whistled loudly. Thankfully, she appeared. I handed her my tripod again and climbed back up the rocks. As I climbed up, I knew I wouldn’t have made it alone. The falls were really pretty. I think that if we had continued down the trail we would have come to more falls but I kept my promise. We hiked back up to the car. The whole hike took about an hour. Super short and sweet. On our way home, we traveled through the Virginia countryside. My girl is a lover of small, quaint towns. We drove through The Plains, Virginia and on towards Loudoun County. We had a wonderful time chatting and driving slow. 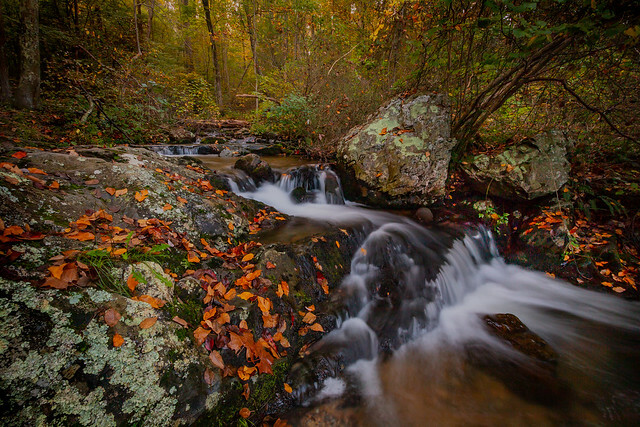 I get to go back to Shenandoah soon and I’m hoping the trees are popping with color. Fingers crossed. I really wanted to visit a waterfall this past weekend. I never can decide where to go but decided to do a return trip to South River. If you’ve been following me for a few months, you may remember I went this past winter in 0 degree weather. I think I prefer that trip and I’ll explain why below. The South River Falls trailhead is located in the South River Picnic Grounds at mile marker 62.7. The circuit I hiked is approximately 6 miles long and covers 2,300 feet of elevation. I started on the South River Falls Trail and went all the way to the base of the falls. You’ll get to a post that says, “Base of Falls”. Continue down that path. On my way back up, I stay on the fire road. 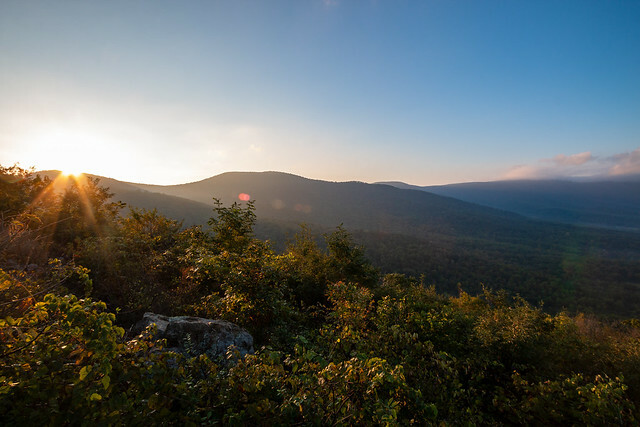 This will cross the Appalachian Trail where you’ll make a left. This will take you back to the South River Falls Trail where you’ll turn right and just about be at the parking lot. 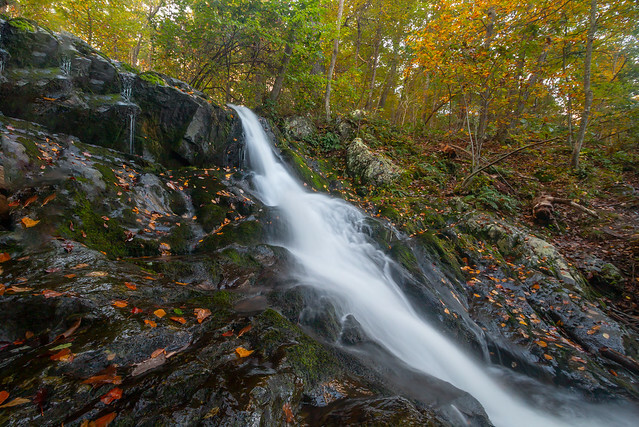 South River Falls is not my favorite waterfall in Shenandoah National Park. It’s kind of weird looking and split. I much prefer Doyles River Falls but I love the hike to South River. There are many pretty cascades. I know it sounds silly but when I made my way to the river I was surprised at how different everything looked. I know. Duh. But in March we had a massive wind storm and the downed trees added to how it had changed. I had to spend time crawling on rocks, balancing on wet rocks and wading through water to get some of my photos. And I loved every minute. The green does add beauty to the photos but I also loved how wide open everything was during winter. I was able to get to some other small falls because I didn’t have to worry about poison ivy or as many ticks or stinging nettles. I had more to photograph and I like that. Also, I think the falls look really cool when they are partly frozen (better than they look now but that’s a personal opinion). I kept telling myself to keep moving. It was partly cloudy and I was worried the sun would be too bright by the time I got to the falls. I just couldn’t help myself when I passed certain small falls and cascades. And unfortunately, a few of my shots ended up with dappled sun. And when I got to the falls the sun was hitting the top of the falls. A photographic disaster. (Laughing) I shot it in a few exposures and I guess the final image came out okay. Sometimes I rush and don’t really think about my compositions. Eventually the sun was out to stay so I had to hike back. But, before I forget, I almost ran into a bear on the trail. I was all alone on the trail. And I mean really alone. I didn’t see anyone for 3 hours. I came around a corner and there was a bear. It was as surprised as me. I backed away slowly as I greeted the bear. I expected to hear it run off but it didn’t. I called out a few more times. Eventually, I saw it walk through the woods at a lazy pace. I was thrilled! Bears don’t scare me. I do wish I had gotten a photo but I thought I should follow protocol. I haven’t ever seen a bear while hiking so this was exciting. Hiking back I forced my pace. With an upcoming Spartan Race this weekend, I wanted to test my fitness and not stop. I did have to stop once or twice but the 2,300 foot climb back up wasn’t so hard. Loved it! I still recommend South River Falls. If you want to be in the water, it’s a great option! And the hike is just about 6 miles. 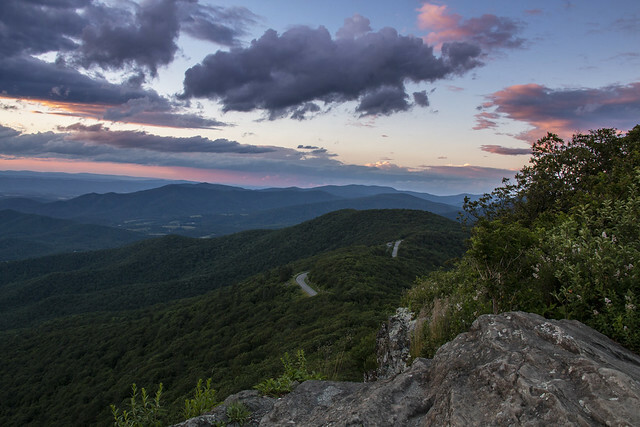 Any time spent in Shenandoah National Park is time well spent. 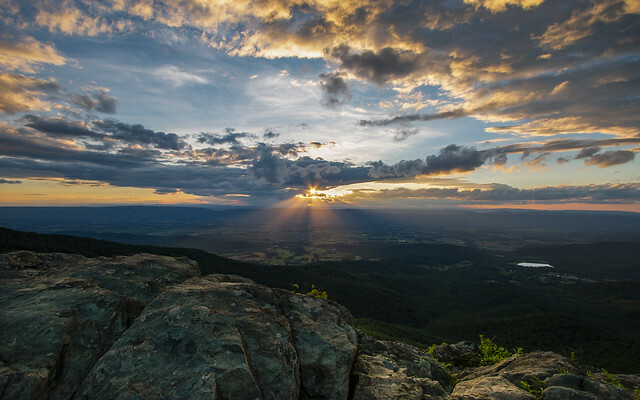 Blackrock Summit in Shenandoah National Park has been on my list for a long time. The southern portion of the park is sometimes hard to get to as it is over 2 hrs from my house. However, I was driving home from Charlottesville this past Saturday so I knew it was the perfect opportunity to stop. I enjoyed a leisurely drive to the parking area from the southern most entrance to the park. 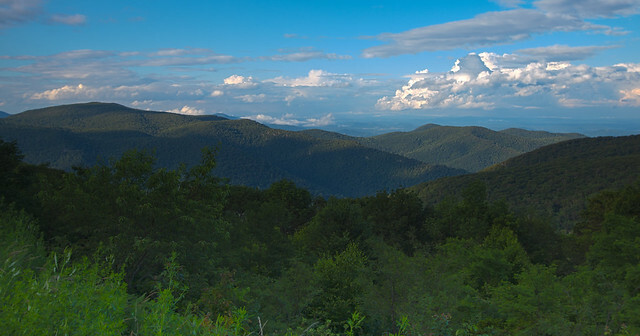 I tried to take some backroads up from Charlottesville and think it is a wonderful way to see parts of Virginia most never do. As I curved around one back road I came upon an old church. 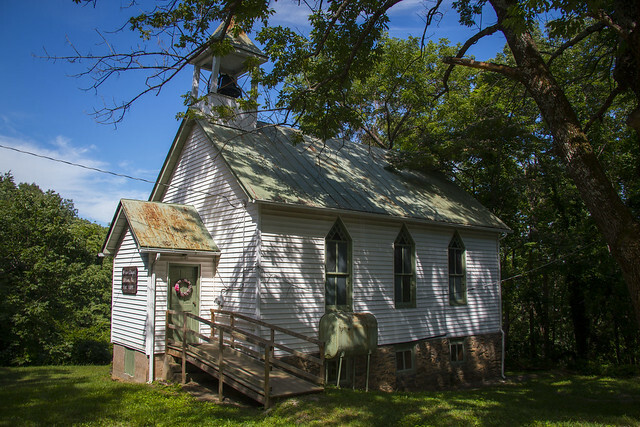 This is the Afton Chapel, built in 1898. Would I have preferred to have better lighting for this photo? Of course but I still think it is very pretty. If you’d like to know a bit of history about the area, click here. I stopped at a few overlooks as I made my way to the parking area for Blackrock. I just can’t help myself. Each view offers something a little different. A different mountain. A different valley. It was such a beautiful day that I lingered at many. 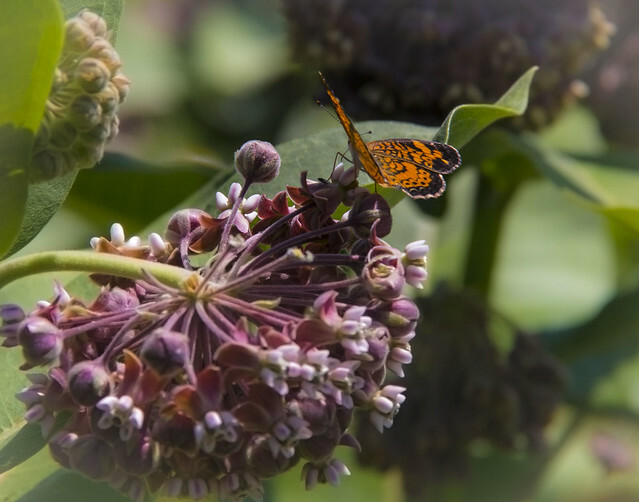 I was also hoping to spot a monarch or other butterfly at one of the stops as the milkweed was blooming. I reached the parking area of Blackrock to the sounds of a screaming child. The poor thing had fallen shortly before returning to the car. I offered any assistance (they had first aid kit – good job, parents!) and chatted with the family a bit. I am always warmed when people are friendly at the park. I would say 90% of the people I’ve encountered are and that’s how it should be. The place should make everyone happy. The trail to the summit it short. I pushed myself to hike it quickly to get in a short workout. And then, you walk out where the rocks form a river, and are encountered with one of the most beautiful views in the park (personal opinion of course). The mountains go on forever. The trees so lush and green they appear to be a blanket laid ever so careful over the ridges. I was in awe. Again, I was met with the sounds of screaming. But this time, it was just a family screaming to each other from their positions on the rocks above. It was jarring. I try very hard to not be a snob while hiking. That defeats the purpose of it being relaxing. However, I find yelling like that in parks unnecessary and rude. As I climbed the rocks, I found that they were not far apart. They were just yelling. I secretly willed them to leave. I carefully made my way further up the river of rocks. I saw small spiders scurry as I stepped on their favorite spot in the sun. As I climbed higher, the sounds of yelling grew quieter. I found a spot to sit and the family of 10 filed out of the area. Yes, they were still yelling. I softened a bit because they seemed very happy and how could I be mad at that. I will not deny having a huge sigh at the peace I enjoyed five minutes later. The trail is down below. Climbing the rocks is great fun! I don’t even feel like my photos do the area justice. The sunlight was harsh for late afternoon. I don’t particularly like my angles but hopefully they will still show how amazing the view is. I sat on a large rock for quite some time. Another couple eventually climbed up near me and it was just the 3 of us for over 30 minutes. I sat there and debated how long I wanted to stay. I had over two hours before the sunset would even start and I was supposed to get up early in the morning for a hike elsewhere in the park. I finally decided to leave. I’d had a long day and knew the 11 miles on Sunday would be very difficult if I didn’t get some rest (funny… I ended up having bad asthma, didn’t sleep, and didn’t hike). I am looking forward to getting back to Blackrock for both a sunset and a sunrise. 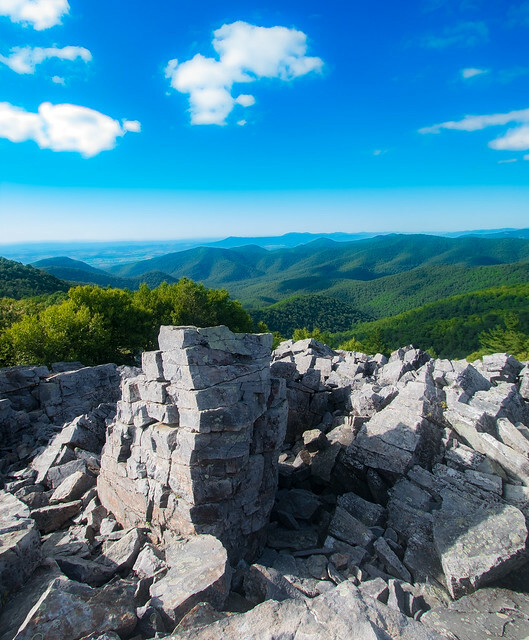 The views are amazing and with a 270 degree view, perfect for both. 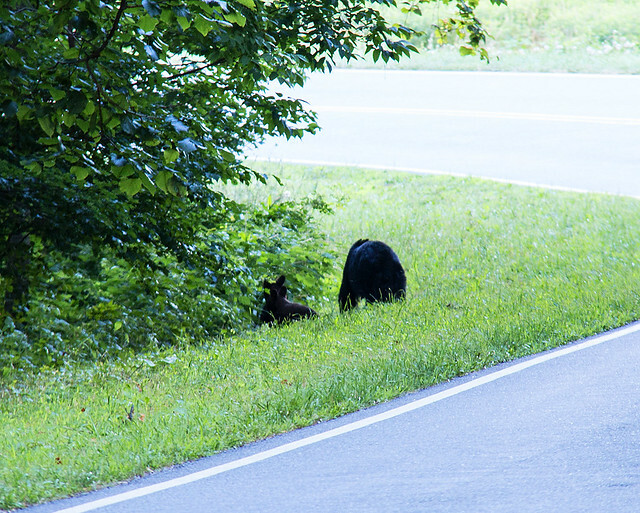 A highlight as I left… I saw a mama bear and her two little cubs. I was thrilled because I never see bears in the park. And then just a couple minutes later, I saw another big bear alone along Skyline. Where has June gone? It seems to have flown by and I feel lost without hiking. I feel like I had a lot more time to hike last year and I need it more this summer. 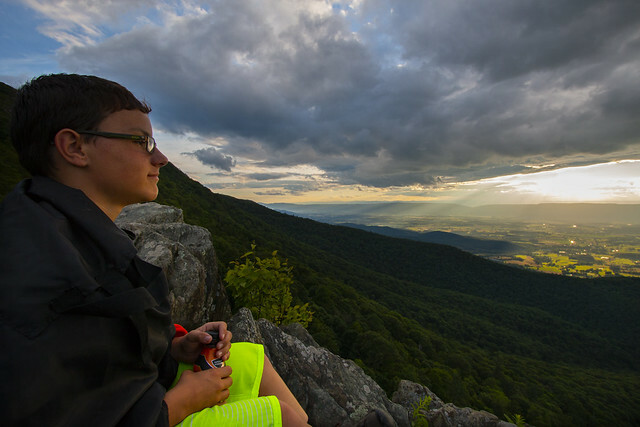 Finally, I told my son that we were going to Shenandoah. I didn’t care what we did or what we saw but I needed the mountains. As we drove there, we encountered a massive downpour. The kind where you can’t really see 10 feet in front of you. And then, as fast as it arrived, it left leaving blue skies and sunshine. Alas, no rainbow where I was. We continued on to the park and arrived at an overlook. I got excited, grabbed my camera and realized I had no memory card. GAH! As I silently cursed myself, I suggested we head to Skyland and see if it was still open. Thankfully, it was and I bought two tiny, overpriced memory cards. We made our way back to the Little Stony Man trail stopping at a few overlooks along the way. If you have never hiked up to Little Stony Man, I highly recommend it. It is a nice, short half mile hike. 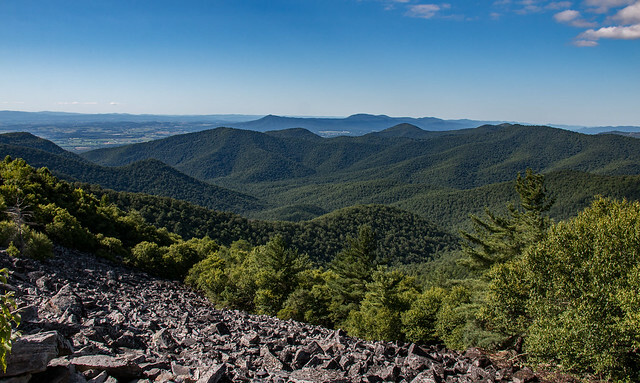 You can continue on to Stony Man or the Passamaquaddy Trail. Who can resist these views? I was happy that there would be some clouds for the sunset. While we were on the trail, he let me know that he hikes with me to make me happy not because he enjoys it. My heart quietly broke. I know I should feel good that my son does something just to make me happy it also makes me sad. I felt like I was instilling a love of the outdoors in him and now I feel like a failure at that. All the times he was excited to plan our spring break hiking trip… the times he wanted to go explore… I thought he loved it. Maybe it is his age. He is 13 after all. I hiked in front of him trying not to cry (just as I am writing this right now). I attempted to focus on the “happy” part and kept going. We reached the small clearing at the cliffs. My son threw down the blanket and stretched out knowing he would have time to just chill while I snapped my photos. At first there were beautiful sunrays filtering through the clouds. It looked amazing even though I don’t feel like my photos do it justice. When the sun made an appearance, it was blazing bright. Almost too bright. I tried some new composition ideas (new to me) and am very pleased with how they turned out. I finally switched my lens so I could get some close-ups. In the past, I’ve cropped because I never think to bring my zoom lens for sunsets. 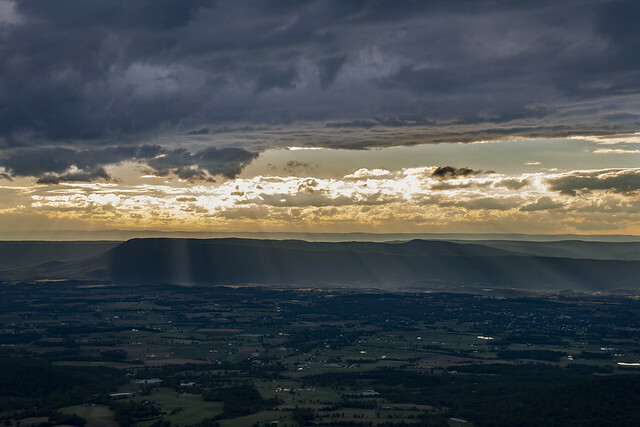 They are some of my favorite Shenandoah photos. 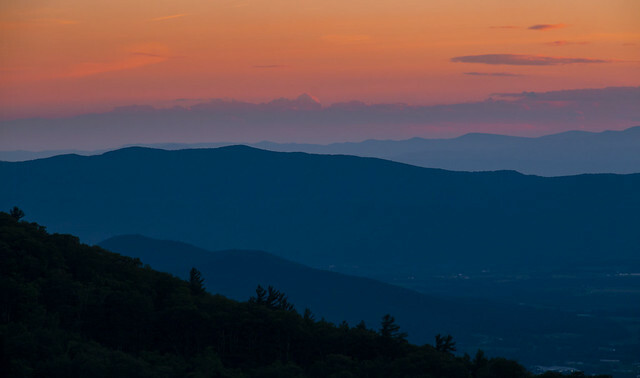 I will repeat it over and over: I love the ridges and layers of the Blue Ridge Mountains. I am so happy with my shots and can’t wait to make prints. My son finally joined me at the sunset. He sat on the rocks and looked out. We saw a Peregrine Falcon flying around and he couldn’t hide his thrill at seeing it. It wasn’t long before he went back to laying down. He has a fear of heights and the rocks turn into cliffs at that location. I went to set up my tripod and realized I had forgotten the nub for my camera. I swear I take photos on a regular basis! Truly I do! For some reason, I rushed packing my equipment this time. I had a specific idea for photos after the sunset but will have to return another time for those. He looks pretty happy, right? On the way home, I reflected on what my son said. I think I don’t believe him. I think he does love the outside. He may not enjoy long, difficult hikes, but I remember how excited he was for spring break. I know how happy he is when we’re out exploring. It wasn’t long before he was asleep and I drove home content with our afternoon and evening.